St. John’s “Conversations in Black and White” has returned with multi -week series that will focus on concepts of transformation, forgiveness, and repentance examined through the lens of scripture and the bestselling book, Writing My Wrongs by Shaka Senghor. 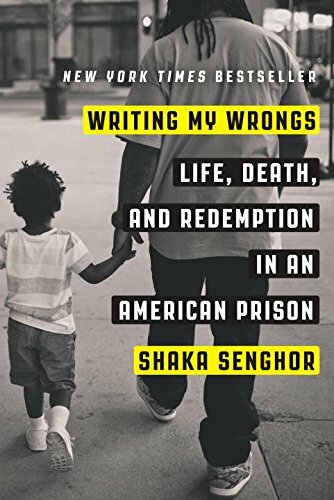 In this autobiographical account, Mr Senghor tells of his journey to prison and toward forgiveness and transformation. Next week, we will be discussing Part III of the book. Everyone is invited. While we encourage everyone to read Writing My Wrongs, doing so is not necessary for participation. The book can be purchased online and several are available for borrowing in the Parish House. Please be advised that Mr. Senghor’s book includes graphic description of drug use, family dysfunction, and violence. The Last session of the series, November 8, will include a pot luck dinner beginning at 6:30 p.m. in the Parish Hall followed by a TED Talk by Shaka Shenghor and discussion. This fall, St. John’s has begun offering opportunities for faith formation on Wednesday evenings, and our programming is well underway. In the Episcopal Church, Faith formation includes practices and opportunities – such as learning, contemplation, praying, worshiping, celebrating and serving that is the lifelong process of growing in our relationship with God, self, others, and all of creation. Every experience in our lives can provide us with the opportunity to deepen and express our faith; the challenge we face is recognizing these opportunities and learning ways to live a sometimes countercultural life in a secular world.